An empty shop window on Deptford High Street becomes itself a display for the Deptford X Fringe festival 2012. 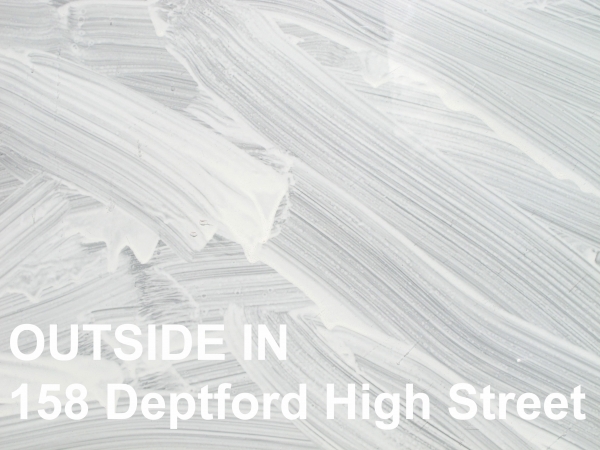 Outside In is a decorative temporary installation drawn directly onto the inside of the window, making use of the glass as a canvas. The layer of the window is what becomes the focal point, not what is inside or for sale. What is on offer is the pattern itself, providing a moment of decorative and visual reflection while both shop and street are in transition. As the street becomes a gallery it offers a new way to experience and take notice - to enjoy the street looking from the outside in.